Good Beer Week has been and gone. Many, many beers were consumed and subsequently a number of badges were unlocked. So here is a quick run down of all the badges I earned pre-GABS (that's a separate review in it's own right...). This first one I believe was a glitch or a redefining of the venues that count. Bar Explorer (Level 50) was the badge, which I unlocked at home... Maybe it just had levels added to it? In any case for every 5 different "bars" you visit and check into you get a new badge level. Anyway Smoothbeard Sparkling Mead was the beer, well mead. Prior to my first Good Beer Week event I started off with a Bacchus Atomic Lime. It was far and away my favourite of the series so far! The lime flavour was excellent and particularly tart. Like all of them that I've sampled, it was very refreshing and the base Berliner Weiss was excellent. Pucker Up (Level 16) was the badge. We kicked off Good Beer Week proper with the Brew vs Cru event at Vue de Monde. It's price may put some off, but trust me it was a brilliant event! The food, beer and wine was all excellent. 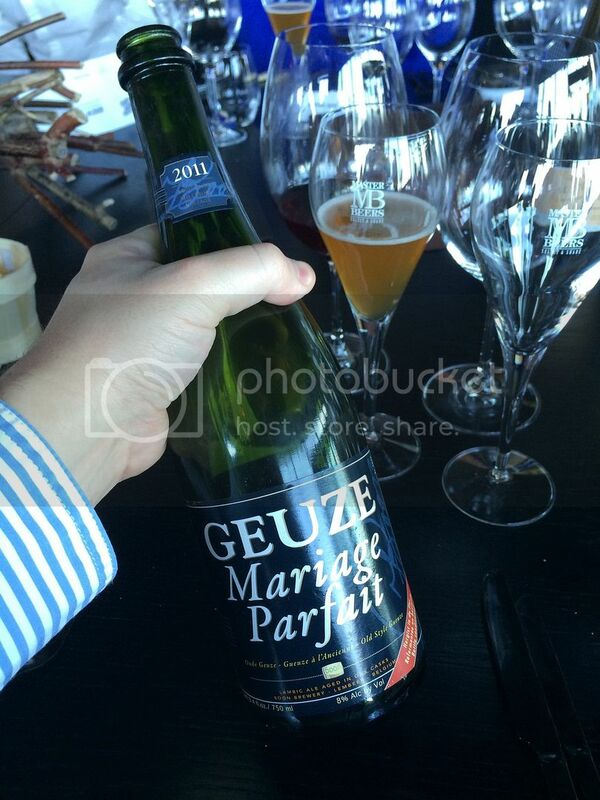 Now the reason we're talking about that is a very special beer, Boon's Geuze Marriage Parfait. It's a beer that I've definitely had before, despite what Untappd may say, and one of the first Gueuze's (indeed sours) that I truly enjoyed - how things have changed since. Level 15 of Belgian Holiday, for drinking Belgian beers, is what we've unlocked. Later that night, after quite a boozy lunch, I thought it best to go on a Pint of Origin pub crawl! We started at The Terminus, quite possibly my favourite pub. Hopped Up (Level 11) was earned by Mornington's Continuous Daryl (it's a Summer joke, Daryl Somers...). Anyway the beer was excellent with Sorachi Ace quite prominent. If you haven't had Sorachi Ace before this would be a good introductory beer which won't overpower you. Paint the Town Red is one of the latest badges to be released by Untappd. As the name suggests it's a badge for drinking Red Ales and Amber Ales, leveling in batches of 5 as usual. I unlocked this badge at lunch on Monday while having a Goat Burger and Goat at Beer Deluxe. The burger was good, if a little small but with a schooner of Mountain Goat Fancy Pants it was $15 well spent. Fancy Pants is one of the 3 canned offerings from Mountain Goat and is a very drinkable Red Ale. I won a competition on Facebook put up by someone who works for a major beer importer and had to come to an Evil Twin Tap Takeover to pick it up. I won 2 x 4 packs of Evil Twin beer, which almost made up for paying $19.50 (yes $19.50!!!) for a glass (300ml or possibly 330ml) of Molotov Lite at Cookie! I know it's imported (and admittedly excellent) but that's an absurd price to pay for beer! I will report back on my findings after I've had it from the can, I was overcome by the price last time and didn't fully take it in... Anyway Land of the Free (Level 35) is why you're hearing about this. Later on Monday night Brewnettes Have More Fun (Level 4) was the first of two badges earned at the South Australian Pint of Origin venue; The Palace Hotel. Frankenbrown from Big Shed Brewing was the beer and I was very impressed with it off the hand pump. It had lovely nutty flavours, which were well complimented by quite bitter citrus hops. Badge number 2 at The Palace was Heavyweight (Level 30). It was my last beer of the night, so my recollections aren't great... It's a beer from Wheaty Brewing Corps, the same brewing company setup at The Wheatsheaf in Adelaide. Wheaty-Bix was the beer and it was a wonderfully creamy Oatmeal Stout with plenty of roast character. It's a beer that I really hoe I can get my hands on again. It wouldn't be an Untappd Catchup without a Tru Bru Bear Club beer making an appearance. This one was no exception with Renaissance's MPA getting a run. I sampled this on the Thursday night of GBW after a very boozy dinner celebrating our successful work accreditation. MPA stands for Marlborough Pale Ale, and this is a big NZ Imperial IPA. It's really well balanced though. For more tasting notes refer to April's Bear Club review, up in the next few days. Drink Like a Kiwi (Level 18) is why we are talking about this now. I've been amazingly busy the last week so sorry for the delay. I'll try and get my GABS badges and review up in the next day or two as well as some Out of Office stuff. In the meantime let me know what you've been drinking and what I should be drinking. I always love hearing from you guys so hit me up; gus.norris7@gmail.com or @Beeroclockau on Twitter.